The leading Asian seeds, led by top three men's singles stars, Lee Chong Wei, Chen Long and Lin Dan, all advanced comfortably to the quarterfinals here today. Chong Wei stormed past Singapore's Derek Wong 21-18, 21-8 while Lin Dan had it easy against Vietnam's Nguyen Tien Minh 21-7, 21-12 in jjust 40 minutes. Chen Long had it even better as he did not even have to take is racquest out when received a walkover from Guatemala's Kevin Cordon. The three top seeds all received byes in the next round to advance straight into the quarterfinals. 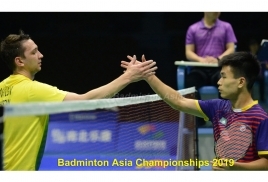 Other leading Asian men's singles players to advance to the next round were Indonesia's Tommy Sugiarto (No. 7 seed), South Korea's Son Wan Ho (8), Taiwan's Chou Tien Chen (6), India's K. Srikanth (9) and China's Hu Yun (10). There was however a stunner in the women's singles when India's Saina Nehwal, the fifth seed, made an early exit due to injury. The other leading women's players to prevail today were China's Wang Yihan (2) and Li Xuerui (3), Thailand's Ratchanok Inthanon (4), Japan's Nozomi Okuhara (6), South Korea's Sung Ji Hyun (7) and India's PV Sindhu (9). Meanwhile, the mixed doubles quarterfianls will begin this morning.